From time to time we have unique pieces that are available for immediate installation. Call our office to find out more, to ask about pricing, and to check on availability. Also visit our Accolades page to see additional award-winning design installations available for purchase. This spectacular installation, designed by Paul LaPointe, Don Younker, and Carol Snow, will make an unforgettable impression on guests to a home or hospitality business. 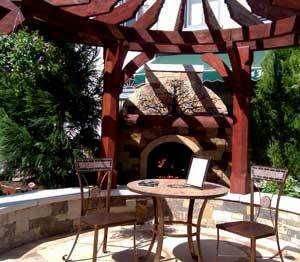 This pergola, patio, fireplace and seat wall composition is ideal for a small space. 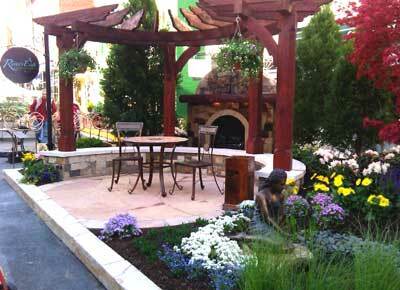 It's also an opportunity to add a special outdoor bistro space for a restaurant, event location, or business. The focal point is a fireplace crafted of firebrick and custom stone detailing by River's End Landscapes' expert stonemasons. Water flows from under the mantle down the face of the stone to create a unique fire and water experience, and a breathtaking display. A curved pergola of custom-milled, pressure-treated and stained pine, creates an embracing and welcoming space. The curved seat wall mimics the radius of the pergola to reinforce the embracing feel of the design. The entire installation, including patio, pergola, plantings and pond, has an approximate size of 16' x 24', but can be customized to fit your space. Components available separately. Each of the components in in this display is available for purchase separately. That includes the curved pergola, seating wall, fireplace, metal tree art, and patio. Call us to ask for details. The "Four Elements" installation would make a beautiful entertainment and relaxation space on a larger property, or a dramatic focal point for a restaurant, luxury apartment building, hotel, conference center, or other commercial property. 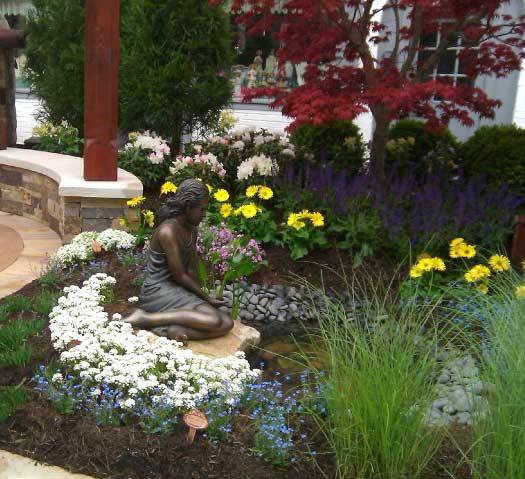 "Four Elements" landscape installation includes a pond with flowering terrestrial and water plants. Water bubbles gently out of the hand of the lovely bronze statue of a seated girl. Sculpture is available separately. 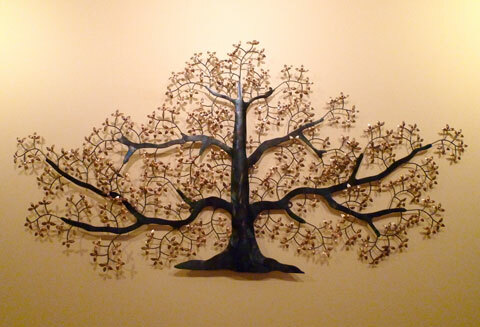 This gorgeous metal tree sculpture covers approximately 3' x 2' of wall (or fireplace) space, and can be displayed indoors or out. It was used on the fireplace above the mantle in the original installation; shown here on an interior wall. Available as part of the total installation, or separately. Call for details. Front view of patio, seating wall, fireplace, and pergola. View of entire "Four Elements" landscape installation. 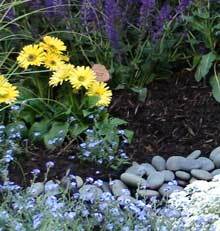 An outstanding display of color, comfort, and drama to enhance any beautiful landscape or distinctive home. Call us for details. 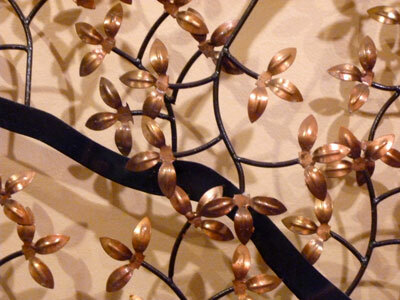 Detail of tree sculpture, showing rich dark branches and copper-colored leaves. The workshmanship is exquisite, and the piece solidly constructed.